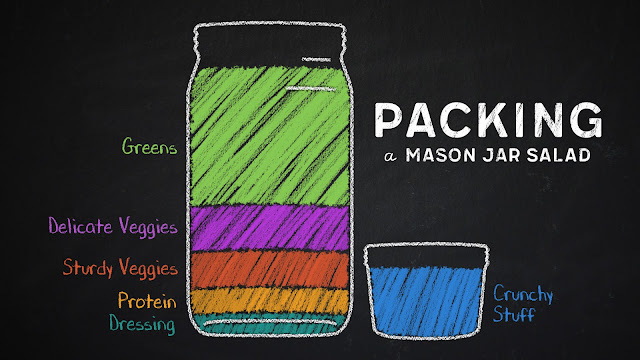 As we prepare to launch "52 Weeks of Mason Jar Salads," I thought I would take a moment and mention a few helpful tools and gadgets you may want to have around for streamlined mason jar salad prep and storage! I would say the most important prep tool (and skill) you will need at your disposal is a good, sharp knife and knowledge of how to use it. There are so many opinions on which knife is the "best" knife, and honestly, I don't think there is a "right" answer to that question. Knives are as unique as the cooks who use them, and my best advice is to use a knife you like chopping with. :) Simple as that! If you don't have knives you like chopping with, or feel like you are ready for an upgrade, I would encourage you to pay a visit to your friendly neighborhood kitchen store and take different types and brands for a "test drive." The best way to decide whether you like a knife is to chop up some veggies! Regarding knife skills ... there are lots of ways to chop an onion, a carrot, a bunch of kale. Some are more efficient than others, and if you are interested in learning some basic techniques, there are a myriad of YouTube videos out there to check out. Otherwise, you could sign up for a knife skills class at your friendly neighborhood kitchen store - another great resource to learn how to safely and efficiently chop veggies for your salads! 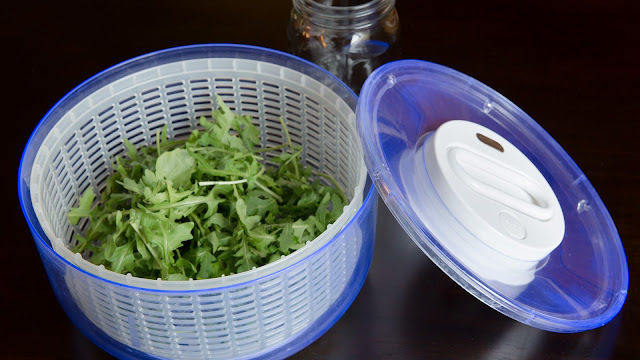 I use our salad spinner on a near-weekly basis for washing and drying our salad greens. Salad spinners also do a great job of drying softer items such as canned beans, berries, or olives. I'd encourage you to invest in a salad spinner if you don't already own one! I luuuuuuuuurrrrve my stick blender. 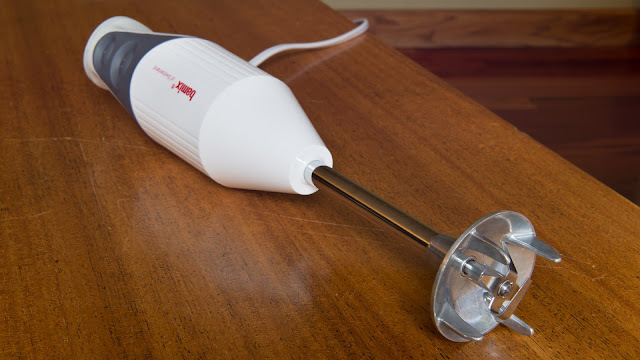 It is the most awesome tool for so many things, including whipping up quick and simple homemade sauces and salad dressings! (And the best part ... you don't even have to pre-chop ingredients such as garlic, fresh herbs, or shallots for your vinaigrettes!) The stick blender allows me to emulsify the creamiest vinaigrettes and puree the smoothest sauces, while being quick and simple to clean up. I would guess the average home cook probably does not have a canning funnel laying around, but they are inexpensive and handy little buggers for packing mason jar salads. I reach for the canning funnel most often when adding beans or grains to my salads. Less mess! 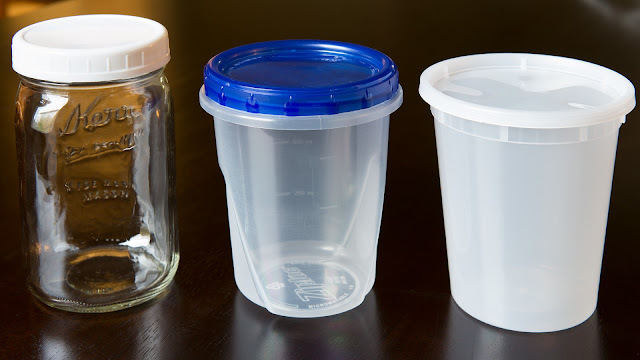 Mason jar salad storage is relatively simple - you don't need much beyond a quart-sized container, and maybe one or two other small gadgets in order to pack an awesome lunch to go! The classic mason jar salad container is, of course, a quart-sized, wide-mouth mason jar. (Wide mouth v.v. important! 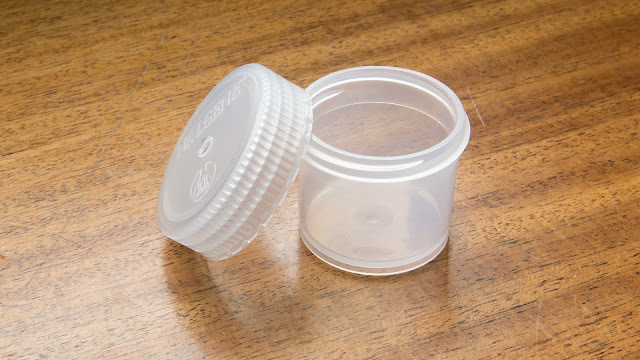 If you pick up regular mouth mason jars by mistake, I would recommend returning them - they are difficult to pack, and I'd bet it would be almost impossible to extract a mason jar salad from one of them!) Tall, plastic quart containers are another option for those of you who may want a sturdier, lighter-weight salad transportation vessel. They aren't quite as attractive as the mason jar, but infinitely more practical! We love these little plastic 2 oz jars for packing nuts, crumbled bacon, or other small items we want to keep crunchy. These little jars fit right inside the top of the mason jar or quart container, making it super-duper easy to grab-and-go those salads on busy mornings. Some bulkier crunchy things such as pita chips, tortilla chips, or croutons pack best in a snack-size zip-top bag. You can use the disposable kind, or invest in a few of the reusable ones that have a zipper or velcro closure, if you are feeling thrifty and/or environmentally-conscious. We typically attach any crunchy things in snack-size bags to the salads using a garden-variety rubber band. Having the crunchy things pre-packed and attached to the salads adds to the ease of grabbing that healthy lunch in the morning as you rush out the door. No need to remember two containers! See you tomorrow for week 1 of "52 Weeks of Mason Jar Salads!" How come the salads don't get soggy? The magic is in how you pack the mason jar salad - layering the dressing on the bottom is key! Check out our post for more mason jar salad packing tips. They really don't get soggy, we promise! Isn't it expensive to eat all that fresh produce? It can be. Produce tends to be one of our biggest grocery expenses each week; however, we see the benefits outweighing the costs. Even though our grocery bills are higher than the average couple's, we find we eat out less frequently during the week if we have grab-and-go lunches available. (We also probably eat more healthfully, too!) When you consider how expensive it is to go grab a sandwich, soup, or salad 5 days a week, the extra money spent on produce starts to seem worth it. Out-of-season produce can be cost-prohibitive (and not all that delicious sometimes,) so we have tried to focus the salads on seasonally-available ingredients whenever possible. We also encourage you to frequent your neighborhood farmer's market, or think about starting a small garden - two more inexpensive ways to get ahold of lots of affordable, in-season produce! Isn't it time-consuming to make all those salads every week? It can be, at first. Like any skill, mason jar salad planning and prep gets easier (and faster) the more you do it! I generally make our salads on Sunday afternoons, and I estimate it takes me about an hour to make four salads, depending on how many different kinds of components they contain, how many of the components I decide to make from scratch, and how much prep those individual components require. (Cooking meat for Rob adds time; washing and prepping large batches of greens also takes time!) We will recommend time-saving tips in each of the individual recipes in the coming weeks! Sometimes salad prep feels like a lot of work on Sunday afternoons, but it such a HUGE timesaver during the week, I feel like the benefits far outweigh the costs. We love the convenience of having grab-and-go healthy lunches all week long! 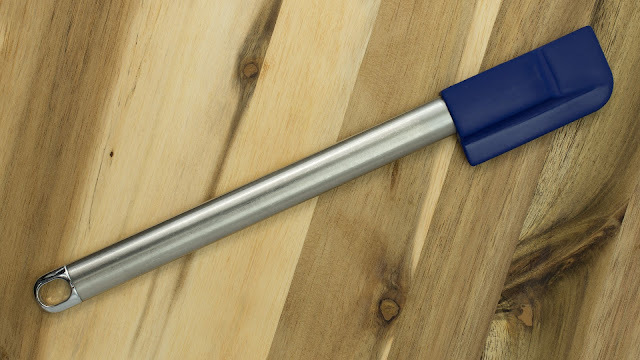 Do you need any fancy tools or gadgets? My answer to this question, when regarding kitchenwares, is almost always, "no." I find I need little more in my kitchen than a cutting board, sharp knives (and knife skills! ), measuring cups and spoons, and good-quality cookware and bakeware. However, there are lots of amazing kitchen gadgets out there, and we have found having a few things pretty darn handy when preparing weekly salads to go. 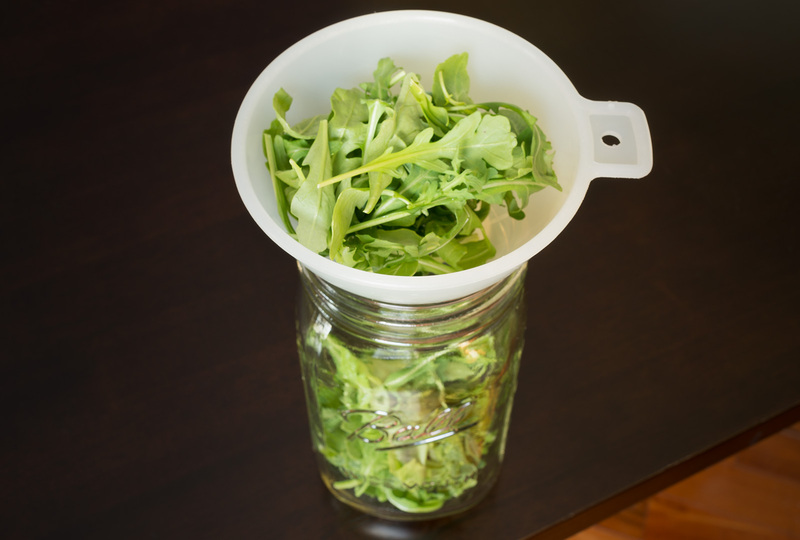 We'll be back later this week with a post dedicated to useful mason jar salad gadgetry! Catherine (content and ideas, recipe development, and writing) has been blogging at "FOOD SNOB" since 2005. She is a teacher by training, nonprofit manager by day, and passionate home cook/baker/canner, environmentalist, vegetarian, knitter, singer, and all-around DIY-er by night. Robert (food styling, photography, and infographics) is a freelance graphic designer and production artist working in the Twin Cities. He is a self-described "happy eater" and grillmeister, loving all foods, both plant- and animal-derived. Robert is a tech nut with an iPhone cable for every room. 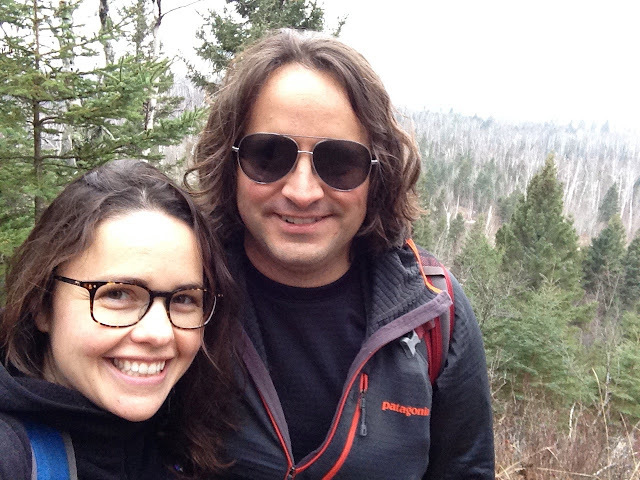 We enjoy gardening, hiking, biking, walking, seeing live music, traveling, trying new-to-us restaurants, thinking up terrible band names, egg sandwiches, and laughing at Rob's cheesy jokes. We met in October of 2015, and make a pretty great team! Hector (Chief Executive Officer in Charge of Napping and Personal Trainer to the Humans) is a Chinese Shar-Pei/American Staffordshire Terrier/Chow Chow/Golden Retriever/Keeshond/Rottweiler former foster dog who never got himself adopted out - Rob decided he was a keeper. Lucky us! He is friendly, calm, and quiet, and loves napping, walking, being with his humans, scratches behind the ears, chasing anything fluffy and twitchy, bacon grease, and Catherine's homemade peanut butter dog cookies. Penny (Chief Executive Officer in Charge of Squirrel Treeing and Personal Trainer to Hector) is a Labrador/Rhodesian Ridgeback mutt we adopted in May of 2017. 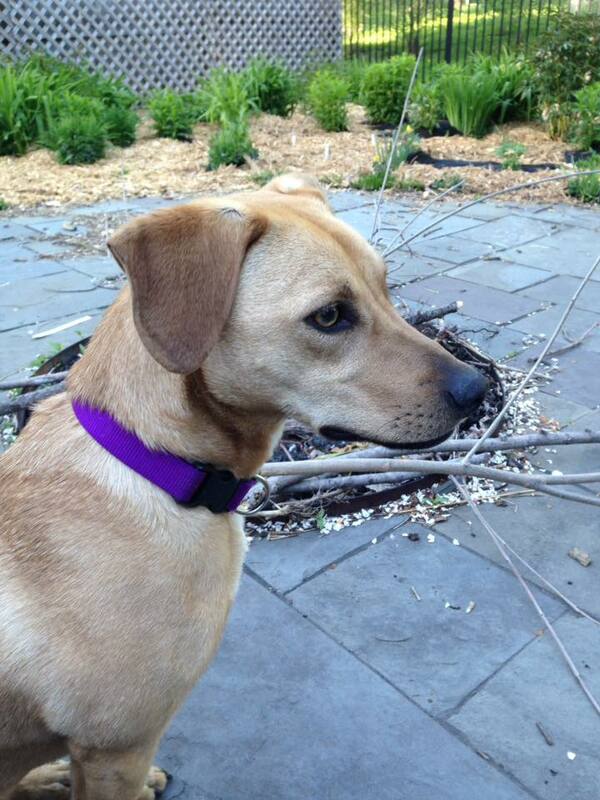 She is friendly, energetic, and quiet, and although we are just getting to know her, she loves walking, running, wrestling with Hector, being with her pack, licking your hands or legs, chasing anything fluffy and twitchy, rolling in the grass, and Catherine's homemade peanut butter dog cookies. Oliver (Chief Executive Officer in Charge of Complaining and Acceptor of Rare Scratches Behind the Ears) is a tortoiseshell tabby Catherine adopted from the Animal Humane Society in 2002, who now lives with her dear friend, Stephanie. 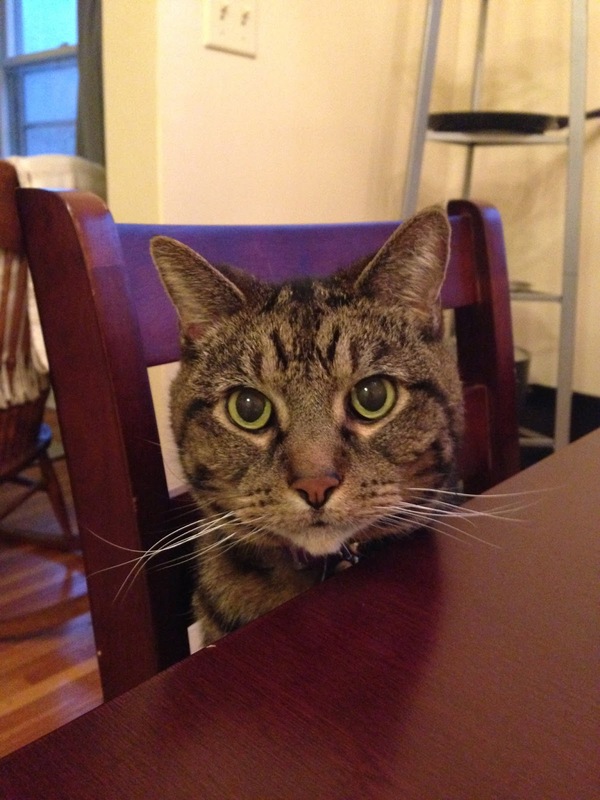 Oliver is a classic cranky grandpa kitty, who enjoys eating, knocking things off shelves, hiding, eating, occasionally escaping the apartment, eating, tipping over the garbage, swatting Hector in the nose, and eating. Basically, he'll be your best friend if he's hungry, then when you feed him, he's done with you. Ah, cats. More to come, as we are furiously putting the finishing touches on our first posts in "52 Weeks of Mason Jar Salads!" It's almost time to launch our new blog series, "52 Weeks of Mason Jar Salads" - the series during which we bring you a shiny, brand-spanking-new recipe for a mason jar salad for 52 WEEKS IN A ROW! Yes! 52 unique, delicious, nutritious, make-ahead, packable salad recipes (adaptable to a variety of special dietary needs) coming your way, via this humble food blog. We're going to start rolling out the recipes January 1st, 2017 (because we all want to eat a little healthier after the indulgent holiday season, right? ), so until then, we thought we'd keep you all busy with a few "prequel" posts. Dressing: always, always on the bottom. Packing the dressing on the bottom of the jar keeps the rest of the salad fresh, and instantly dresses your salad when you invert the salad into a bowl! Win-win. Protein: we've found the protein component of the meal (diced/shredded meat or cheese, beans or lentils, cubed and browned tofu or tempeh, hard-boiled egg, etc.) can stand up to up to a week of slight soaking in the dressing, so it makes a natural second addition. Sturdy Veggies: things like shredded carrots or beets, edamame, green peas, sugar snap peas, sliced red onion, roasted potato or sweet potato, dried fruits, sweet corn, and the like do well next. 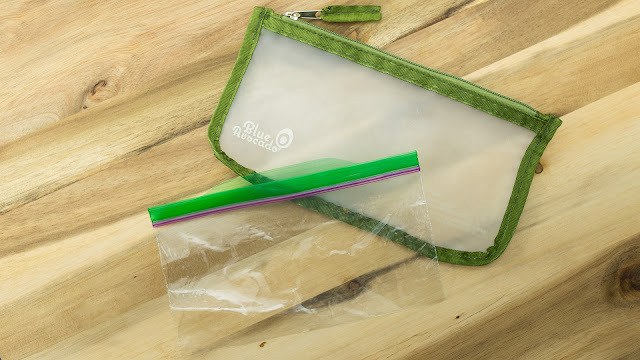 They can survive an accidental splash of dressing if your salad tips in your bag on your way to work, and provide another layer of protection. Delicate Veggies: tomatoes, bell peppers, cucumbers, fresh fruits, and anything else juicy and highly perishable belong next. If they happen to "weep" at all, the layers below can handle the extra moisture, and they are lightly cushioned by the top layer in your jar. Greens: always add to the jar last! We have found greens such as shredded kale, cabbage, or collards, fresh baby spinach, and romaine do exceptionally well in mason jar salads, as well as fresh herbs and some head lettuces such as butter or bibb. We have had varied success with mixed baby greens, although we enjoy them immensely! Crunchy Stuff: sometimes you may want to add nuts or seeds, croutons, crushed tortilla chips, cooked and crumbled bacon, or other delicious toppings to your salad that would become damp (and therefore unappetizing) if added to the jar. We find packing those items separately (in a snack-size zip-top baggie or small container) to be the best strategy for keeping crunchy stuff crunchy! We have found that by following this packing method, our mason jar salads stay fresh in the fridge for up to a week, providing us convenient lunches (and sometimes suppers) all the work week long. 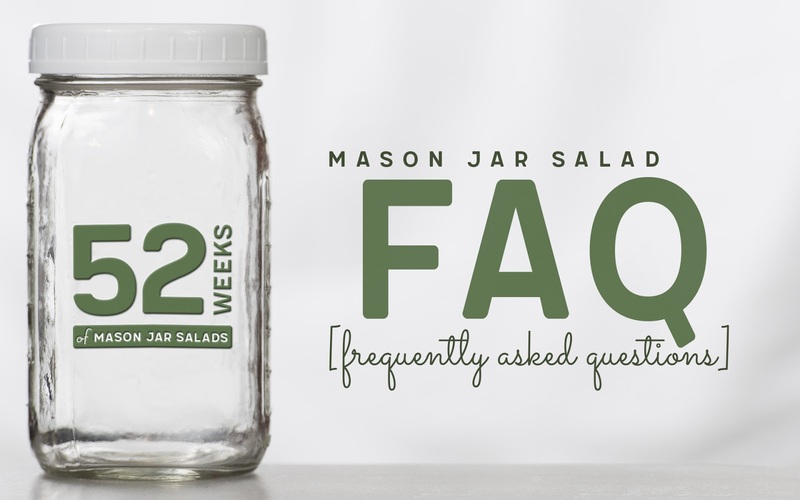 See you soon for more tips as we count down to the launch of "52 Weeks of Mason Jar Salads!"